Ahead of the assembly elections next year, the BJP has been wallowing in a welter of ideas that has resurrected the debate on populism versus pragmatism, as it has to pander to two important but incompatible constituencies, of the freebie consuming masses and Bengaluru's heavy hitters craving for even roads, pristine lakes and unbroken power supply, reports Radhika Ramaseshan. Six months before Karnataka was to vote, the Bharatiya Janata Party was searching for a catalyst to recharge the cadre, unify squabbling state leaders, birth a slogan and shape a comprehensive outlook. It's been wallowing in a welter of ideas that has resurrected the debate on populism versus pragmatism, as it has to pander to two important but incompatible constituencies. These being the freebie consuming masses and Bengaluru's heavy hitters, craving for even roads, pristine lakes and unbroken power supply. 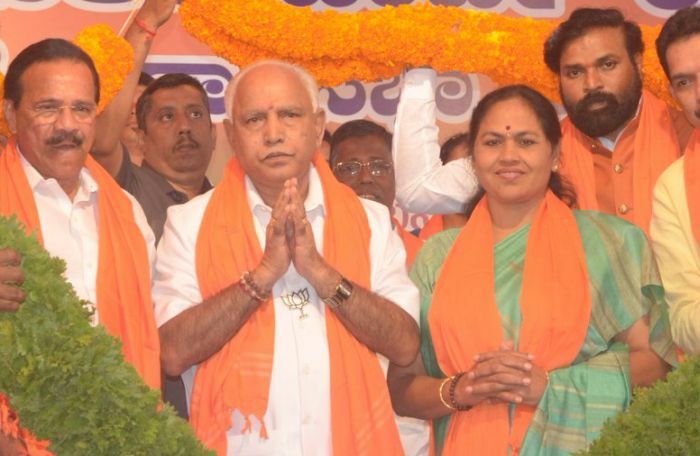 It was thought that the BJP had to discard the baggage -- bearing B S Yeddyurappa, now its chief ministerial candidate. A central BJP functionary protested the suggestion on Yeddyurappa, saying, "He was opposition leader for five years. The (ruling) Congress had enough time to prove the so-called charges but (only) when elections are round the corner, it raises them. We are on a safe wicket on corruption." However, Suresh Kumar, a former senior minister, agrees that the land and mining scams associated with the BJP’s previous regime 'clouded' its achievements in governance, notably the Sakala Services Act, 2011, that empowered citizens to demand time-bound government services. Therefore, it was time to brush away the cobwebs, give the party a fresh lick of paint and present to the voters the idea of a 'New Karnataka', a simulacrum of the Prime Minister Narendra Modi's 'New India' concept. Kumar helmed a 17-member committee that was asked to produce a 'vision document'. It would detail the BJP's position on 25 sectors, including industry, the informal economy, agriculture and education. Kumar was concerned over the perception that his state could be dubbed a laggard, compared to its robust neighbours, Andhra Pradesh and Telangana. "Karnataka must motivate itself. The IT (information technology) sector is still diffident about staying as number one, compared with aggressive Hyderabad," he said. He formed sub-groups to meet people in the districts and know what they expect of a 'New Karnataka'. "It will cohere with Modi's vision because that alone will instil confidence," said Kumar, conceding the PM was central to the blueprint. To underline the BJP's seriousness about governance as distinct from politicking, the panel got in retired state bureaucrats, M Madan Gopal and C Somashekhar. Gopal, like Haryana's Ashok Khemka, was frequently transferred during both the BJP and Congress regimes. He outlined his views on the legislature-executive equation. "Karnataka's losing credibility because of the trust deficit between ministers and officers. The CM has not spoken to officers for two years. Frequent interactions are called for. Notwithstanding the BJP's endeavour to project a business and investor-friendly face before the next Karnataka election, its government’s record on the economy was a mixed bag. Growth in GSDP was 7.8%, behind (undivided) Andhra's 8.8 and Tamil Nadu's 9%. Private investment fell by 8-10 per cent in the manufacturing sector. The share of services in GSDP increased from 52.8 to 58.9% but industry's share dipped from 31.3 to 25.9%. Factory growth had flattened in 2008-09 and 2009-10 but increased 26% in 2010-11, according to central data. But, Andhra was ahead at 53%, Maharashtra at 43%, Tamil Nadu at 38% and Gujarat at 37%. Retained premier place in IT sector. According to Planning Commission data, Karnataka recorded average annual growth of 5.1% in agriculture and allied sectors between 2005 and 2012. "There should be a fixed tenure for civil servants. An integrity pact between the government and civil society organisations is a must, so that responsible citizens have a legitimate right to question without confrontation. "Lastly, bring in Modi's governance strategies, make bureaucrats accountable, audit their work, make the administration transparent and integrate technology with governance," said Gopal. Somashekhar and he impressed on the BJP to get 'practical' about populism, not promise the moon. If Gopal suggested coalescing of technology with governance, K Amaresh was preoccupied with 'democratising' of IT. The idea being that IT come out of the '10 per cent niche' inhabited by the big dads and spread itself 'more equitably'. On September 10, at a function hosted by Bengaluru's techies to felicitate Ananth Kumar, the new Union skill development minister from the state, Amaresh, who heads the state BJP’s IT cell, asked for imparting of IT training to skill development learners, instead of honing only their existing skills. "The government doesn’t have to teach plumbers, electricians and artisans hereditary skills but teach them to market these through software-enabled programmes. We must impart high-end skills. MPs want young people to handle their Facebook, Twitter, videos and how to use Google. The focus should be on brand-building activities," said Amaresh. He added the BJP should unveil its position on finding new uses for IT, instead of moping over job cuts in the established companies. While expressing concern over the Congress government's 'overall apathy' towards industry that resulted in the flight of Hero MotoCorp and Asian Paints to, respectively, Andhra Pradesh and Telangana, Trivikram Joshi, co-convener of the state party's trade and industry cell, spoke of how not one of the 170-plus applications to create new small and medium industries had been cleared in five years. "SMEs are the big job creators. Land for procurement was identified in the dry belt. People were ready to give uncultivable land, for which they would have got four times more than the official price plus one job for a family member. The government wouldn’t budge," said Joshi. Shivkumar Udasi, the BJP's member, Lok Sabha, from Haveri, pushed hard to get a Tata Metaliks plant in his constituency and got in-principle sanction from Yeddyurappa when CM. Tata Metaliks left because the next Congress government refused to sanction a mining lease. "The government uses the (Congress-led) UPA’s (United Progressive Alliance’s) investor-unfriendly Land Acquisition Act that makes acquisition tough," rued Udasi. If voted to power, the BJP says it is bent on implementing an industrial policy its government had formulated in 2006 and speeding of land acquisition in arid areas. The BJP says it will resuscitate Karnataka's 'failed' economic and financial management and the 'crippled infrastructure'. For this, it says it will stress on the industrial policy and land acquisition rules it had notified when earlier in power. Identifying and using government wasteland for job generation. Creating a land bank by an inventory of surplus and unused land available with the state, state undertakings, urban local bodies and 'suitable' private land. 'Clear-cut' land acquisition policy, in consultation with farmers and industry; spelling out clearly that only dry and single-crop land will be taken for industry; excluding land that houses temples, crematoria, schools, playgrounds and houses. 'Adequate' relief and rehabilitation package to the owners. Clause to complete development of land and implementation of project on acquired land within a deadline. At least a fifth of all acquired land to micro, small and medium enterprises (MSMEs) for back-up vendor development support to larger projects. Some land earmarked to create social infrastructure such as houses, schools and hospitals. 'World-class' infrastructure to investors like all-weather roads, uninterrupted power supply, water, railways and port connectivity, and warehouses. In large industrial estates, 20-25 per cent land reserved for townships. 25 km of Suvarna Karnataka Development Corridor will run through industrial clusters and satellite towns. Supportive package to companies and entrepreneurs. When the BJP was in power, it issued notifications under the Karnataka Land Acquisition Act to speed up the process, with deputy commissioners of districts to initiate and complete the procedures. Other aspects of the industrial policy were creating a single-point clearance for Special Economic Zones before seeking the Centre’s approval, purchase of 15 per cent of goods manufactured by MSMEs by government departments and state PSUs, and relocating industries from cities to the outlying areas. To encourage manufacturing, the policy stated that transaction costs must be scaled down in the areas of taxation and land acquisition, with 'friendlier' labour and environment laws. The BJP was part of a brief coalition with the Janata Dal-Secular in 2006, ruled for exactly seven days in 2007 and returned to power with a near-majority in 2008 and ruled until 2013. Comparable figures for Andhra and Tamil Nadu were five and 4.6 per cent. From day one, Yeddyurappa tried to make it clear that his government was for the farmers. He wore a green shawl and took the oath of office in the farmer's name. His close aide, Ganesh Karnik, says the next government’s thrust will be equally on agriculture, education and industry. Image: Former chief minister B S Yeddyurappa who remains central to the BJP's plans for Karnataka. Photograph: Kind courtesy @BSYBJP/Twitter. Has language war put BJP on back foot in Karnataka? Is Karnataka India's most corrupt state?